If you have ever mistakenly purchased a bag of raw peanuts at the grocery store, you might like to learn how to make your peanuts grow. You can start this as a small project in a pot just for fun. Later though, you will want to plant some in your garden and grow your own peanuts. There are four main types of peanuts grown in the United States. They are a very important crop in the south, grown for many products including peanut butter, oil, roasted peanuts and more. The most commonly grown types of peanuts include Valencia, Virginia, Spanish and Runner. Runner is the type used in making peanut butter. The others are often sold as roasted peanuts as well as used in other products. For home gardening you will most likely use Virginia peanuts. You can obtain seed easily by purchasing raw peanuts at your grocery store. If you have accidentally bought raw peanuts instead of roasted, and you have no interest in boiled peanuts, you will be happy to know that they don't need to be wasted. You can learn how to make your peanuts grow! You can also buy seed from catalogs and possibly even at your local garden center. Virginia peanut seed can be purchase from Burpee and Park Seed Company. The reason peanuts are an important crop in the south is because the south is the best place to grow them! Peanuts are warm season annuals that need at least 120 of frost-free temperatures to mature. However, if you will just be growing some in a pot, you can get away with growing them in cooler climates if you keep them indoors. While you aren't likely to harvest any peanuts this way, it can still be fun to do. 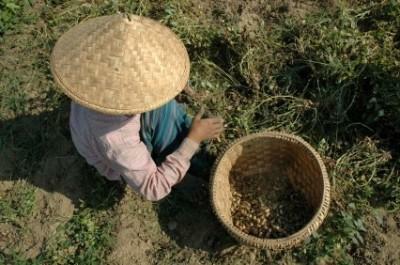 Peanuts are legumes so they are cultivated in a similar way to other legumes like peas or green beans. If you have peanuts in the shell, you will need to remove the shell carefully without removing the papery skin of the seeds. Peanuts like loose, well drained soil. If your soil is compacted you will need to till it so the peanuts are able to penetrate the soil. You can amend your soil with peat moss to give it a looser texture. After all danger of frost has passed, plant your seed an inch to an inch and a half deep. They should be spaced six to eight inches apart to allow room for the plant to grow. Spacing between rows should be about 24 to 36 inches. About 30 to 40 days after your peanuts seedlings emerge from the soil, they will begin to form small, yellow flowers. During this time it is important to keep the surrounding soil cultivated to that the stalk or peg is able to penetrate the soil later. Cultivation will also help keep weeds at a minimum. After these flowers have been pollinated, the peg begins to grow longer and turn down into the soil. This takes about 10 days. Once the peg penetrates the soil it will take about a week for it to start forming pods with seeds. These will be your peanut crop at maturity. Once the peg is in the soil, stop cultivating the surrounding area in order to avoid damaging the plant. One to two inches of mulch can be applied to retain moisture and combat weeds. Maturity will take nine to ten weeks but they will mature at different rates depending on when each one flowers. You will know when it is time to harvest when, usually in late summer, the foliage turns yellow. Now is the time to carefully dig your peanut plants with a pitchfork. Shake off any loose soil and hang the entire plant in a warm, dry area for a week or two. Check them often to prevent your peanut crop from being eaten by hungry mice! Once they have dried, shake off the remaining dirt and pick off the peanuts. These should be air-dried for a couple more weeks and then stored in a cool, dry place until you are ready to use them. You can roast them or try them boiled. Don't forget to save a few for next year's crop.